It's ironic that the oppression brought to our country by colonialism also gave South Africa a game that transgressed racial boundaries and became so ingrained into our black South African culture that to me (a fair-skinned South African) it seems as though football originated in Africa. Even though it never originates here, it really seems like an African sport! More than 20 years ago, during the apartheid years, football was also segregated according to racial lines. Separate governing bodies existed and separate stadiums housed football events. Hell, football matches were even used by the ANC to hold "secret" political gatherings! Today our country's flag, shown in the photo, symbolises exactly what has happened to football over the past few years. 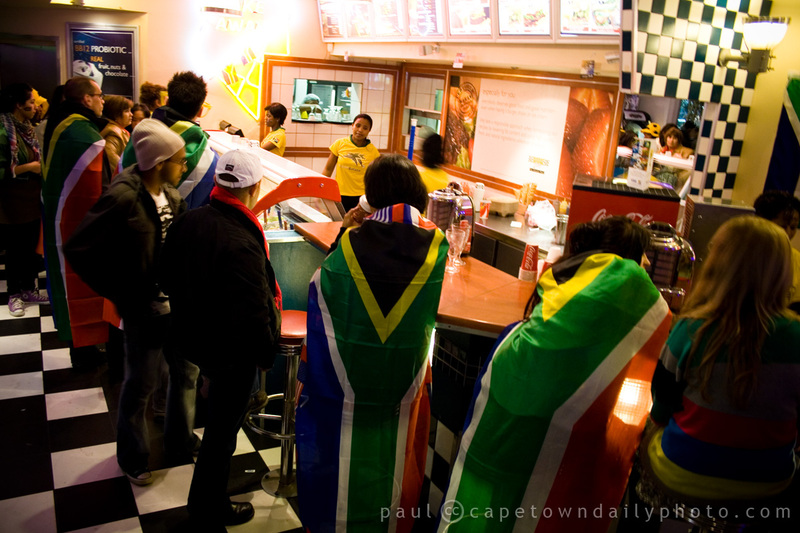 The paths of different races and cultures have joined to unite in common support for our team, Bafana Bafana. We thought it amazing when black South Africans joined in support of our mostly-white Springbok rugby team. I now find it even more amazing how white South Africa has joined with black in support of the mostly-black Bafana Bafana team. Bafana Bafana, even though you lost the match on Wednesday evening, you've made your country proud. All the best for the next game! ===========<O "Paaaaaaaarrrrrp"
Posted in General and tagged 2010 world cup on Thursday, 17 June, 2010 by Paul. Alex, I wouldn’t be surprised at all! Check this out.